Many people experience acid reflux these days, and it can be a very painful, irritating and potentially deadly experience. Acid reflux occurs when acids and partially digested food rise into the esophagus. This causes heartburn and burping. Sometimes the chest pain associated with acid reflux is quite severe. In fact, many people have mistaken it for a heart attack. It’s important to treat acid reflux promptly because repeated exposure to stomach acid can cause damage, inflammation, hemorrhaging, ulceration and scarring of the esophagus. Long-term exposure can even cause a esophageal cancer. 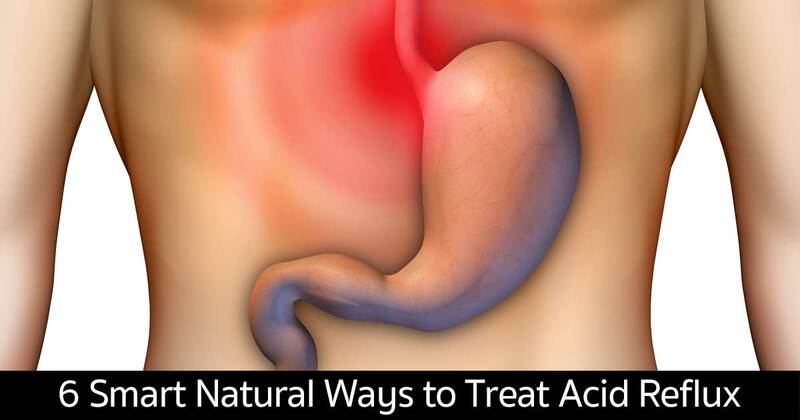 In this article, we will discuss half a dozen natural ways to combat acid reflux. Read on to learn more. #1 – Keep your stomach acid levels balanced. This is especially true of the level of hydrochloric acid in the stomach. It is important to increase your stomach’s natural production of this vital digestive acid. Begin by replacing plain table salt with a good quality of Himalayan crystal salt. This all-natural salt contains trace minerals and chloride. Your body needs all of these. Additionally, you can take a HCL supplement 5-10 minutes before eating. Look for one that is plant derived and contains betain, an important digestive enzyme. #2 – Avoid sugar and processed foods altogether! Strive to eat a balanced, healthy, natural diet that consists mostly of fresh, organic vegetables and fruits. Fresh produce contains important digestive enzymes. Additionally, support good digestive function by taking an effective probiotic supplements such as Latero – Flora. This is a high quality supplement that will introduce abundant friendly bacteria into your bowel. #3 – Add a digestive enzyme supplement to your daily routine. Raw foods are filled with beneficial enzymes; however, when you cook your food it destroys the structure of these enzymes. In addition to eating healthy, natural, raw, stir-fried or lightly steamed veggies, you should also take a good supplement. One excellent example is Veganzyme. #4 – Make good use of apple cider vinegar. The raw organic kind is the right kind. As a tonic, add a tablespoon of apple cider vinegar to a highball glass (4 to 6 ounces) of pure, filtered water. Drink this before every meal. It helps settle your stomach acid and supports good digestion. #5 – Use organic baking soda to settle your stomach. Baking soda and water is an old-fashioned remedy for indigestion, and natural bicarbonate is excellent for soothing acid reflux. To use, stir a teaspoon full of baking soda into a glass of pure filtered water. Drink it down quickly. Be advised that baking soda contains quite a bit of sodium, so if your doctor has told you to reduce salt in your diet or if you have hypertension, you should consult your doctor before doing this. #6 – Soothe your intestines with aloe vera juice. As with all supplements, look for the organic version of aloe vera juice. It helps support digestion and heals inflammation in the intestines. It also helps to quell symptoms of acid reflux. When you begin to feel the symptoms coming on, mix an ounce of aloe vera juice with 2 ounces of pure, filtered water. Drink this down quickly to settle your stomach. Understand that acid reflux is more a symptom than a condition. If you are experiencing acid reflux, it means that your body is suffering from a fairly high level of toxicity. It will take some time to perform all of these cleanses. Don’t overdo it because doing so can make you quite ill.
Purchase high quality cleansing products and follow directions carefully. Support your efforts by taking good care of yourself otherwise. Eat a balanced, natural whole foods diet, and be sure to get plenty of good sleep to promote overall healing.